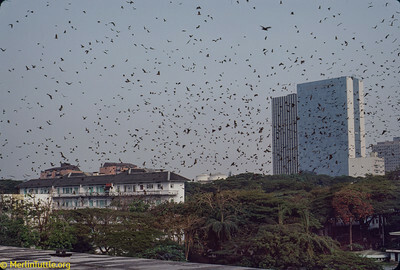 Hundreds of thousands of Straw-colored fruit bats (Eidolon helvum) beginning their evening departure from a city park in Ivory Coast, Africa. Cities often provide the only homes safe from commercial hunters who sell them for people to eat. Despite such large numbers having lived in close assoiation with humans throughout recorded history, they have not caused disease outbreaks. Their remarkable safety record casts grave doubt on recent speculation of their being dangerous carriers of disease. Even in cities like Abidjan in Ivory Coast, Straw-colored fruit bats (Eidolon helvum) are intensely hunted by teenage boys who earn a good income selling them for people to eat. Though over hunting poses a threat to these bats' survival, there is no evidence that the people who eat them contract diseases as a result. Even in cities like Abidjan in Ivory Coast, Straw-colored fruit bats (Eidolon helvum) are intensely hunted by teenage boys who earn a good income selling them for people to eat. Though over hunting poses a threat to these bats' survival, there is no evidence that the people who eat them contract diseases as a result. This casts serious doubt on claims that bats are dangerous sources of disease. An Egyptian fruit bat (Rousettus aegyptiacus) eating a ripe mango. These bats are often exterminated when mistakenly accused of fruit crop damage. Merlin Tuttle investigated in Keyna, doumenting that, though fruit bats eat mangos in orchards, they only eat those that ripen prematurely or are missed during harvest. Marketable mangos must be picked at least seven days before ripening, at a time when they are too green for bats to eat.